How do we optimise behaviour? The report found that unfortunately, behaviour has not been taken seriously enough in the past and official data has underestimated the extent of the problem. Sleight of hand has been common and external accountability has meant some schools have not declared swathes of poor behaviour. The report was written by the government’s behaviour ‘tsar’, Tom Bennett, former teacher, author and founder of researchED. Tom once said, “Teaching is not a mature profession, it’s a semi-profession” and openly acknowledged that it took him five years to be able to run a classroom properly and another five years to understand how he did it. Teachers, no matter how skilled, cannot intervene with the same impact as a school leader can. This isn’t rocket science: if senior leadership is misguided, woolly or weak, then expect tectonic stresses and toxicity where behaviour is very likely to be out of hand, dire, even abysmal. Schools cannot rely on super-hero teachers, mavericks, a solo charismatic or a few ‘shoot from the hip’ tough-nut teachers – the culture of the school has to be consistent, tip-top and no nonsense throughout. If so, it might need a total rewire. The recommendations are there for the taking, but they aren’t quick-fixes. Creating a culture doesn’t involve going ‘techniquey’ and seeing tools as solutions. Culture creation is a delicate alchemy that requires ambidextrous thinking led by a fearless and tactical leader who works on the far side of complexity; someone who gets at the underlying issues through ambition, industry and good strategy. 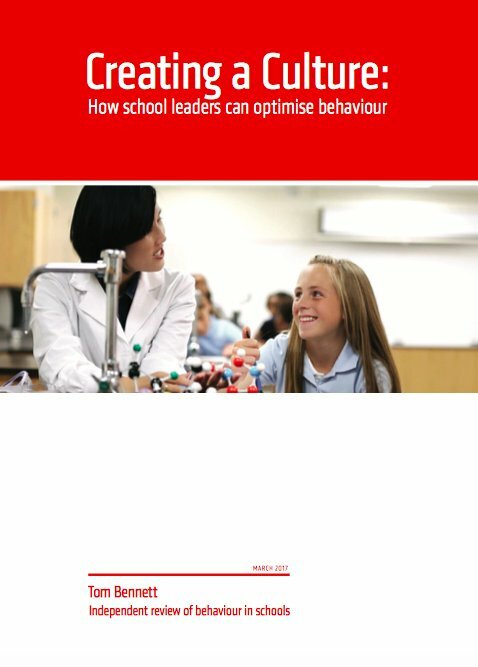 This resource provides a number of ‘culture-busting’ ideas, strategies and building blocks to help school leaders along with instructions on how to create and implement a successful ‘School Culture Rewiring Team‘. The fundamental question that school leaders should ask themselves regarding their school cultures is this: Is it the sentry at the door or the monster under the bed? In other words, is the school culture something the senior leadership team can predict and control or does it control them? If you are looking to bust a culture and rewire your school then become a circuit detective and visit other more effective schools and look at their cabling and connections. The Bennett Report infographics are produced by the brilliant Oliver Caviglioli.